Every mother wants their child to be healthy and they will do practically anything in their power to provide safety, good health and nutrition to them. When we talk about nutrition, the number one source of infant nutrition is milk. There are blooming researches and new discoveries about infant nutrition. No matter how many findings there are, nothing can ever beat breastfeeding. Breast milk contains all of the nutritional requirements that a baby needs: immunity building properties, nutrients, antibodies and fatty acids. And it was found to adapt to what the baby needs, in terms of its nutritional content. Even with all the milk present in the stores, those in the medical field still recommend breastfeeding up two years of age. Breast milk does not need preparation and sterilization. The iron content in breast milk is significantly higher than that of the commercial milk products. With breast milk, your baby has lesser chances of having diabetes, gastroenteritis, asthma and ear infections. Connection between the mother and the child is established and strengthened through breastfeeding. Breastfeeding is environment friendly: no packs or equipments needed. Breast milk does not cause constipation. Breast cancer, arthritis, osteoporosis and diabetes are less likely to develop during later years for babies that have been breastfed. Unlike the formula milk, there is no strict amount of breastfeed to give to babies in a day. It will all boil down to the the growth and development of the baby. Aside from breast milk, you can also give your baby foods that are pureed or blended. Just like all other human beings, babies also have their own preferences when it comes to taste. You can give a small amount of your own food to them, as long as they are soft enough. Vegetables are good for babies. As long as its clean, colorful and soft, it is good for them. You may boil, steam, or puree the vegetables, depending on the baby’s preference. Fruits are also recommended too, because of their nutrients and vitamins. 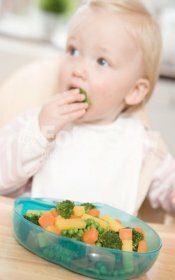 Babies chew food using their gums so be considerate in preparing food for your baby. Apart from food, table conversations are also helpful for stimulating the baby’s brain activity and building connection to people. To further guide you on what and how often you have to feed your baby, here are some guidelines to be aware of. During the first six months, at least six times of milk feeding a day is advised. Solid food is not yet recommended since breast milk or the formula milk is enough to give the baby the nutrients he needs. In the baby’s sixth to ninth month, four to five times of milk feeding per day is ideal. Giving one meal of pureed food is good for starters, then you can upgrade it to three meals. During the baby’s tenth and eleventh month, let him drink milk three to four times a day. Three meals and two in-between snacks is also advised. Try giving food with lumps to stimulate chewing. Once your baby turns one, give milk three to four times a day, while gradually increasing the meals and snacks. Food should involve harder parts that will encourage chewing and self-feeding. In the baby’s sixth to ninth month, four to five times of milk feeding per day is ideal. Giving one meal of pureed food is good for starters, then you can upgrade it to three meals.